A first impressions hands-on user review of the new standard definition dual-tuner DVR, Pace TDC575D, aka Vegas aka TDC 575D. Make sure the DVR is not recording a program in either tuner, and it won't start recording in the next few minutes. Press the Power button on the remote and very quickly press the OK/Select button on the remote. 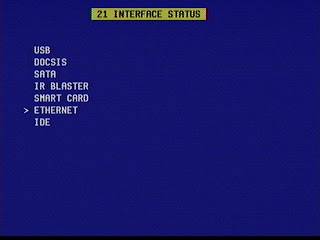 This brings up the Diagnostics menu. The Left and Right arrow keys take you in and out of each submenu option. 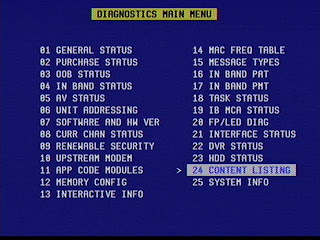 This is a very informative, clean and detailed diagnostics menu. To see a bigger picture just click on each picture or open it in a new window. 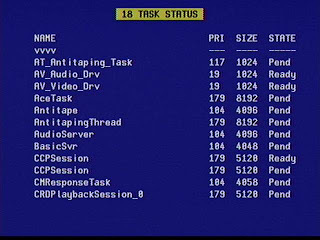 Some fields of interest: name of the program, size of the MPEG file in bytes (1.67GB in this case). The time appears to be in GMT or some other format. Why? 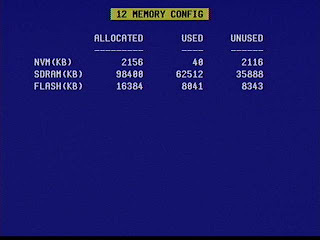 This program was recorded at 10:58pm pacific time on 6/14/07 but shows as 05:58am of 6/15/07. The Average bit rate is shown which is exciting. 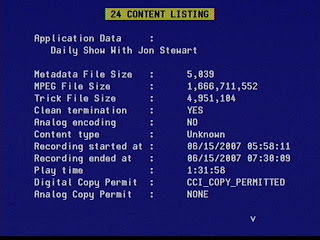 This episode of the Daily Show was at 2,415,576. Remember this is an ADS box, so everything it receives is already pre-chewed in digital format. 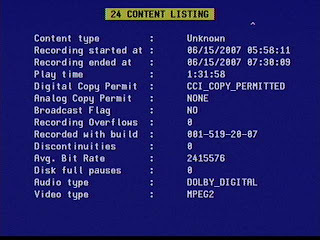 Also shown in the audio format (Dolby Digital) and the Video type (MPEG2). Also included are permission flags and entries that would report problems/errors during the recording. In the cases of programs that were interrupted by a crash/freeze, the indicators show no problems. But in one instance it shows a file size of 0 bytes, playing time of 0 bytes, bit rate of 0, but 5072 bytes of metadata. But I can play the program. Perhaps these are the types of problematic recordings that cause the cascading freezes I was epxeriencing??? (only a hypothesis, but I will try to test it). The metadata file size seems to be around 5072 bytes (I saw one program with a few additioanl bytes). The number of reboots is shown. 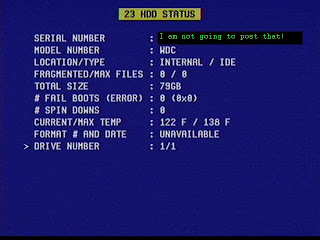 See the Crash Log in the Box #2 post for more details on most of those reboots. 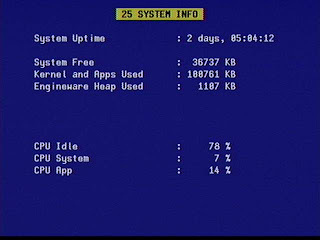 This is nice, it shows the uptime of the device. It would be nice if we could also see all these numbers while the machine was busy running (eg recording on both tuners or during playback). Not sure what these really mean. Option #21 may be of interest to connectivity fans. It would take too many screenshots to show the options one by one, so here is what I found out: USB, SATA, IR Blaster, Smart Card and Ethernet are not enabled.